“Change is inevitable.” Most of us have heard this phrase at one time or another. With the passage of time, we mature and evolve, gathering new interests and experiences. Hopefully, we make improvements in how we relate to our spouses. It’s important to become more accepting of our partner’s shortcomings as well as less critical, realizing that criticism does not contribute to open communication or a closer bond. Maybe we’ve come to understand our husband or wife better as we discover his or her vulnerabilities. Needs change over time, which means that we must respond differently to our partner. Changes give us a chance to become more patient and compassionate. We can become better listeners and more in tune with the thoughts and feelings of our partner. When challenges involve one partner having to give to another, the result is less selfishness. So change can be very good for the relationship. What if change is brought about suddenly? What if something is thrown our way that is unexpected? Couples deal with life’s twists and turns all the time. We are called to respond to the changes. How can we deal with change? One way is to remind ourselves that we must be flexible. What does that mean and what does that look like? Flexible means that as much as we’d like to persevere with our goals, our agenda and our path, we sometimes might have to redistribute our priorities or abandon our intentions in favor of what is thrown our way. For example, a mother has an important business-meeting scheduled that she absolutely cannot miss because she may miss an opportunity of a lifetime. Her two-year old child wakes up with a dangerously high fever and she chooses to cancel her meeting. A couple celebrates their third wedding anniversary to the news that the husband has testicular cancer. He chooses to undergo chemotherapy which includes no marital relations for a year. These situations require quick decisions and a deviation from the expected path. Sometimes we have to remember the serenity prayer: “God, grant me the serenity to accept the things I cannot change; courage to change the things I can; and wisdom to know the difference.” Flexibility means having the wisdom to know the difference and accommodating and adapting to situations as they arise. Those who are rigid and insist on fighting may find themselves frustrated, anxious, worried or out of balance. Choosing not to adapt can lead to mental and physical health problems. Another way to deal with change is to not be overly attached to a particular outcome. A couple who worked hard all their lives might look forward to retiring in a tropical resort area, with gated community and a plethora of amenities. When told that their grandchild has terminal cancer, they might choose to remain close to their family and delay or cancel their plans. On a more serious level, let’s say your spouse was diagnosed with depression. He or she is not the person you married. Those who took their vows seriously will be committed to their partner, “in sickness and in health,” even if it means several years of struggle. Perhaps the partner needs the strength of his beloved. People are diagnosed with depression; people come out of depression. The right professional help can assist those who deal with major changes that are chronic. If you are having a hard time coping with change, try changing your THOUGHT(S) about what is going on in your life or marriage, rather than emphasizing ACTION. Actions first require thoughts. Are you being patient? Are you afraid? Are you being resistant to the change? Do an attitude check. Does it make more sense to embrace this change (even if unwanted) or fight against it? Consider what it would take to have the courage to see yourself on the other side of the change. What would that look like? Will you live or is it so monumental that you will fall apart? Do you need outside help, even if it is just a friend to express your anxiety or excitement? We do not ask for most of the changes that enter our lives. They just happen. Many changes help us grow and mature and this is a good thing. Oftentimes, we don’t think so, but it time, we know change helps us grow in ways that are needed for us on our journey. What do you do when you are faced with a major, unexpected change in your marriage? Meet Greg and Sherrie Piburn. After thirteen years of marriage, Sherrie developed serious, chronic conditions, including fibromyalgia and several maladies that involved surgery, rehabilitation and landed her in the hospital for long periods of time. Greg and Sherrie shared their story on my radio program on 11/30/10 (www.blogtalkradio.com/marriagecoachlynn). 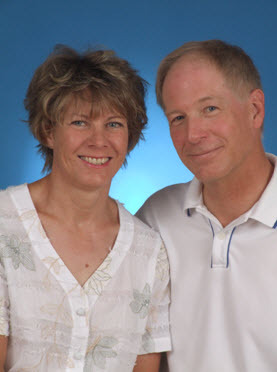 Greg is author of Beyond Chaos: One Man’s Journey Alongside His Chronically Ill Wife.